This morning, the Ukrainian army reported that the number of Russian invasion forces attacks “over the last day” stood at 50 in total. Such a figure was not reached since the Minsk agreement took effect in early September last year. 4 Ukrainian soldiers were killed during these 24 hours, and another 8 injured. At the same time, 2 civilians were killed and 8 injured in Donetsk city due to shelling over the same period of time, according to the city administration. While over the last 4 months of the Minsk “ceasefire” and the Ukrainian-called in “silence mode” from December 9, the number of daily Russian attacks never fell below 5 and in average stood at 10-20 per day, 50 is a new peak and the final proof that the current appeasement policy by the Ukrainian government, namely the September 5 and 19 “truce” and the December 9 “silence mode”, are not working. However beyond that doubtless admission, the question arises, what the strategical aim of these attacks could be and why Russia is willing to turn up the heat again despite the fact, its territorial gains inside Ukraine are not challenged and it could consider itself satisfied with the strip of land, it has brought under its control so far. 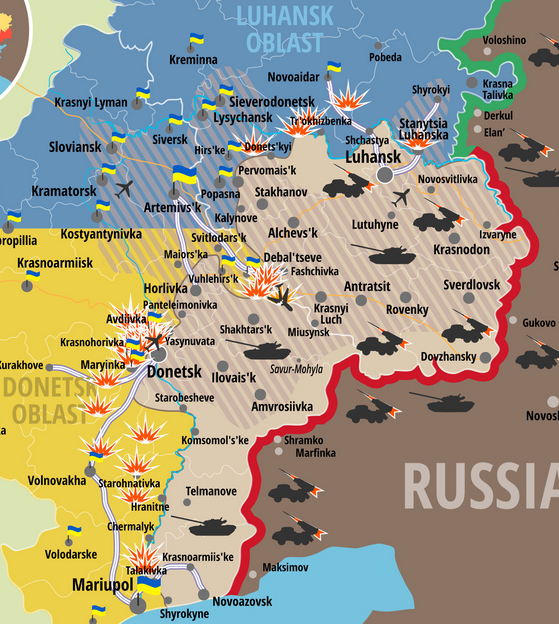 A – meanwhile – good indicator for the daily spatial allocation of the Russian aggression is the situation map, published with daily updates by the Ukrainian defense ministry. After months of showing a far too “optimistic” picture, it is now quite accurately filled with most recent information and, despite missing some attacks, a good foundation for a more detailed analysis. At a first glance, the large number of “locations of combat” – indicated by the small orange explosions – along the front strikes the eye. While an exact count of those little “blast” symbols is not possible, it is fair to say, that their number is well below 50, showing the difficulty that comes with such sources. However what can be seen is that those symbols indicating fighting are ranged along the border between the Russian-held and the “liberated” Ukrainian territory with some dots being further inland, signaling long distance weapons fire. The following map is an – informed – strategic assessment of those “locations of combat” (also known as “Russian assault target areas”), dividing the entire territory into four combat zones. Doing this, it becomes possible to make sense of these dozens of attacks, assigning them to possible mid- and long term in strategic goals of the Russian invasion army. 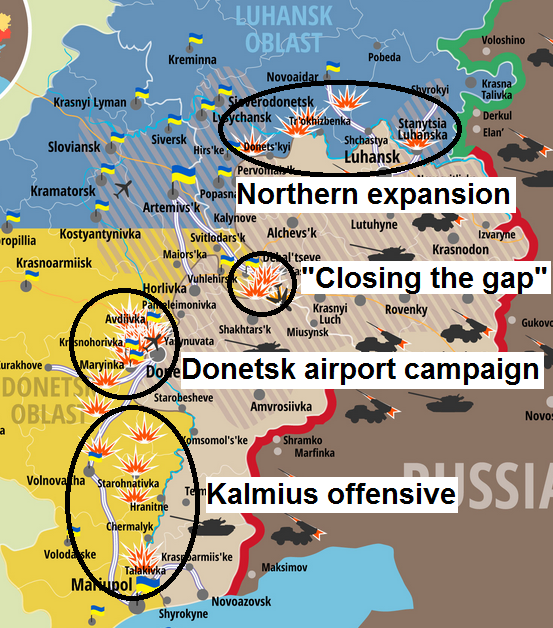 What becomes visible are four main theaters starting with the “Kalmius offensive” in the south, the “Donetsk airport campaign” in the west, operation “Closing the gap” in the center and the “Northern expansion” in the north. These four offensives will be discussed in the following paragraphs, trying to understand what could be Russia’s purpose by leading them. After invading southern Donetsk region in late summer last year, Russian forces quickly advanced via Novoazovask and Telmanove towards the west. Not the Ukrainian army, but a natural barrier, the river Kalmius slowed down their advance, giving retreating Ukrainian security forces the time they needed to build a line of defense -behind the river. Between September an December 2014, Russian forces mainly attacked the towns and villages east and north east of Mariupol, but only very rarely the wide strip of land between the coastal town and Starobasheve. This changed on January 3rd, when Russian invasion forces started using heavy weapons like artillery, tanks and multi launch rocket systems to launch attacks on several towns right along the river as well as Ukr-held towns and villages behind it, serving as resupply bases or simply resting areas for Ukrainian troops – and homes to thousands of civilians. These attacks intensified over the last week, expanding not only to indirect fire, but also to actual crossings of the river and attemps to flank Ukrainian troops, taking Hranitne, one of the few towns with a bridge across the Kalmius. Several Russian troops were killed during these attempts. Nonetheless, during the last 2 days, this offensive was even intensified with a double-digit number of attacks between January 8 and 9. Attacking the Kalmius river (Minsk demarcation line) on the entire front bears several strategic advantages for an invasion army, not feeling bound to any signed treaties. During August and September 2014, it attempted to directly attack Mariupol, which didn’t work due to a strong buildup in Ukrainian army and National Guard troops. Later, they tried to bypass the city with the aim to encircle it, some 5-10 km north. This also miscarried. By broadening the active front line by around 60 km, Ukrainian defenders are forced to stretch thin, trying to halt any possible crossing of the river along the sparsely inhabited riverside. This is of particular importance as we are in the middle of winter and the river may freeze, allowing troops and vehicles to cross it without the need of a bridge. The riverside was until a few days ago only guarded by scattered Regiment Azov National Guard troops, being equipped with mostly light vehicles like jeeps and small arms with a few heavier weapons like T-64 tanks or ATGM to defend against attacking armored vehicles. Furthermore, the Kalmius river frontline is one of the closest to the Russian border and the main invasion hub, making it easy to resupply advancing forces from inside Russia. If Russian forces manage to push back Ukrainian defenders at only one sector of the river front, they will be able to establish bridgeheads on the left side of it, being able to directly attack cities like Mariupol or Volnovakha, which might be the final aim in this region. It is no secret that Russian forces seek to entirely control Donetks airport which must feel like a sting in their meat, being a – hypothetical – direct port for attacks on the DNR’s wannabe capital Donetsk. Thus, this front was always one of the most active, also and especially during the almost 4 months of the Minsk ceasefire farce. Until December 9, Ukrainian forces defended like lions, firing back with all kinds of weapons at Russian attackers and killing up to 500 of them within a few weeks (maybe even more between late August and early December). However then president Poroshenko decided to forbid his forces returning fire “until their lives were in acute risk” and Russian forces established launching grounds for attacks all around – and not more than 50 meters from Terminal 1 and the Tower, which are today the only installations held by the so-called “Cyborgs”, the defenders of the area. Still, all attempts by the invader to directly attack the terminal complex were fought back with huge casualties on the Russian side. This fact plus the circumstance that attacking forces are now too close to the target to use heavy weapons against it led to a final change of mind with the attackers, deciding during the last 7 days not to cut the airport from the Ukrainian-held territory anymore but the territory from the airport, encircling it in a wide curve, forcing – then – besieged forces to surrender as for the lack of food and ammunition. Similar tactics were used successfully in Saur Mohyla and Ilovaisk in late August last year. On January 5, the Ukrainian intelligence service voiced exactly that concern, namely that a pincer movement by Russian invasion forces from Spartak and Donetsk’s Kuibyshivs’kyi district is in the planning and would have the price of the entire airport. Such move has to be prepared, taking into account that strong Ukrainian army formations are positioned all to the north, north west and west of the airport. So Russian army artillery and missile troops started shelling not some but literally all Ukrainian held towns and villages in the three cardinal directions of the airport. 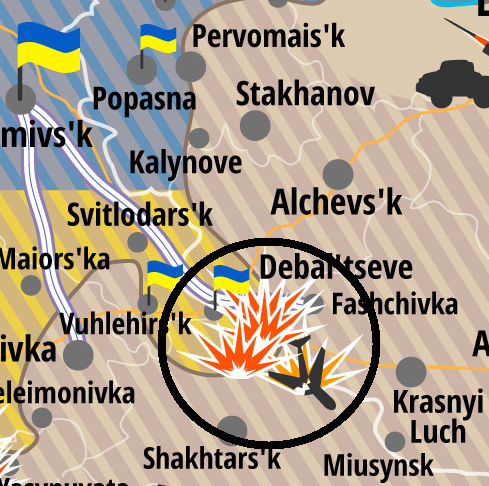 As the ATO map is not able to show such concentration of fire in a meaningful way, I developed a map with the exact targets according to the Ukrainian army reports. Thanks to the RT cam, live footage of the shelling can be seen and heard day and night, week for week, month for month. After realizing that a direct assault would be impossible and the Ukrainian-given period of time to gain strength, Russian forces seem now self-confident enough to prepare for a much wider offensive, not only trying to invade the airport, but all the Ukrainian-held front line towns around it. The Ukrainian-held area leading to the important railway knot city of Debaltseve not only looks like a cut into the “self- or rather: Moscow-declared people’s republics of Luhansk and Donetsk”, it also feels like one for the both regimes and their Russian masters. At the same time, it is an obstacle in logistical terms for invasion forces, wishing to move freely between Luhansk and Donetsk city. Thus, it is a declared goal by the Russian occupation command to close that gap, if not by negotiations (as was hoped for in mid September), then by force. This target was never given up during the “ceasefire” and there was not one day without attacks on front line villages like Nikishyne. However rare footage from the area (by Graham Phillips) showed some rather poorly-equipped Russian and pro-Russian infantry troops, not being able for major offensive operations in October and November. Now, Russian forces use large caliber weapon systems like Grad missiles and even tanks, especially over the last 48 hours. This indicates, they move from “provoking” Ukrainian forces holding that front to rather serious offensive operations, possibly resulting in territorial gains and the ability to directly attack Debaltseve itself. Last but not least, Luhansk region remains another hot spot of Russian invasion ambitions. During the first months of the “ceasefire”, the area along the Bakhmutka highway (M04), leading from occupied Luhansk to liberated Lisiciansk was one of the most active zones of confrontation. “Russian Cossack” terrorist troops felt – seemingly against all agreements as they received multiple heavy weapons to invade Ukraine – not bound to any orders from Moscow anymore and attacked at will, capturing “Checkpoint 32” and Smile in late October, taking more than 100 km² of Ukraine. However after this, troubles grew between those forces and the Moscow-loyal “LC (Luhansk Poeple’s Republic)” regime, resulting in battles against each other and a lull in fighting the Ukrainian army. Ultimately the most rebellious Russian commanders were either killed (January 2) or forced to return to their homeland (January 5) and the Russian army took control of all fighting forces in the area. Since then, the front is even more active and dangerous with a Russian invasion army, willing to recapture the earlier-lost territories around Severodonetsk and Rubizhne in the north west as well as Stanitsa Luhanska in the east. Especially this area would Russia give more kilometers of direct border line between its mainland and the invaded territories inside Ukraine, being a win-win situation in its perspective. In conclusion it is simply a fact that shortly after the observed and confirmed reports of rotation and replacement of former paid mercenary forces with regular Russian army troops all across the occupied territories of Donbas, attacks on Ukrainian positions and towns as well as their deadliness have sharply increased. After those 50 attacks being shown in the map used for this analysis which took place between January 8 and 9, the following 12 hours brought another 24 attacks on Ukrainian forces, indicating that there won’t be any let up in the near future. Russia definitely has once again turned up the heat and increases its efforts to control even larger parts of Ukraine, willing to conquer those in a brutal and way which is against international law and against all its promises to at least calm down the situation or even better withdraw its forces from Ukraine. On the Ukrainian side – and I know, this sounds like a broken record, actions must be taken now to spoil Russia’s appetite for more Ukrainian land by letting them pay for every square meter they attack as much as possible. This might be the only way to lead it to a major decision: “Blink” once again like in the end of August and being punished with more international sanctions .. or finally come to its senses and stop its obvious efforts to illegally capture more soil of its western neighbor. This entry was posted in Ukraine and tagged Ukraine Russia invasion Donbas by Julian Röpcke. Bookmark the permalink.